This is from the 2004 New Hampshire primary. I haven’t seen it reproduced anywhere. I love this photograph, which could be labeled Poll Dancers. There is a lot going on, including the expressions of the poll workers, the color and texture of the setting–look at that beautiful table–and the formal relationships in the visual composition of the scene. The basic design is what was called a chiasmus in classical rhetoric. The formal pattern for chiasmus in a verbal text is ABBA: “Let us never negotiate out of fear, but let us never fear to negotiate.” In a visual image, the equivalent figure would be a crossing pattern that carries a change in meaning or joins opposing concepts. In this photograph, this pattern is cued by the legs of the two poll workers: each are crossed, front foot toward the other. This unconsciousness entrainment is mimed by their arms and turned heads, and by the spontaneous entrainment of the two voters stepping out of the booths. The symmetrical alternation by gender links the two pairings, who together form a large X if you draw lines from head to toe, male to male and female to female. Each of the two couples has nearly identical expressions on their faces, and the seriousness of the citizens who are voters is complemented by the good vibe of the citizens who are tending the polling place. The smiles cue emotional response to the rest of the scene, even though it is obvious that those smiling could not be reacting to those behind them. Likewise, it doesn’t matter that the viewer will never know the joke being shared by the two volunteers. Their smiles, along with the informal clothing of all four figures and the fact that all are acting as if no one is watching, make the scene a celebration of the beautiful egalitarianism of democratic elections. This more complex sentiment is shaped by the red, white, and blue cloth draping the voting booths. Wrapped in the national colors, the voters’ accidental choreography symbolizes that elections can aggregate private decisions by strangers to produce social harmony. 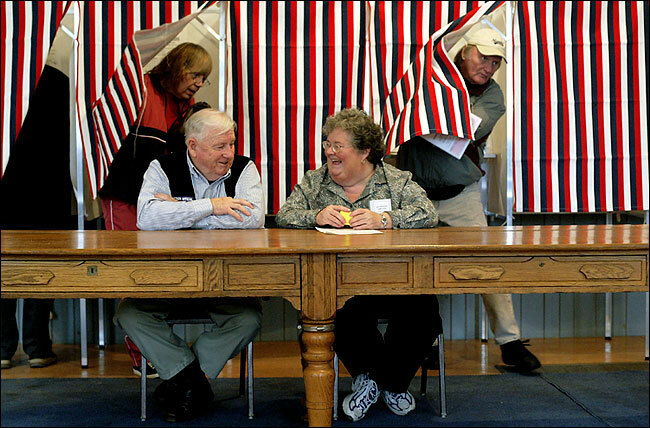 The woman on the left and the man on the right are different individuals, but they unconsciously move in unison on election day. Note also that the photograph has no news value. We know that thousands voted, that many voting stations and voters look very much like these, and so forth. Instead, the photograph crafts an emotionally rich performance of democratic life. The vernacular life of small town democracy temporarily is given national significance and emotional resonance; likewise, the social form of citizenship, which often is disembodied, standardized, and abstract, becomes more embodied, familiar, and particular. Aesthetic judgments have to be specific, particular judgments, just like voting, and so there is yet another continuity offered: the act of voting, which only a few were able to do yesterday, is extended to all who are able to view the photograph. One act of citizenship becomes multiplied many times by public spectatorship. The cynic could point out the virtual citizenship is a long way from political power, and for that voting and viewing often are about equally useless. My attachment to the photograph is not nostalgic, as I see it as a still present reality, but it certainly is sentimental and idealistic. Just like voting. Photograph from the New York Times.